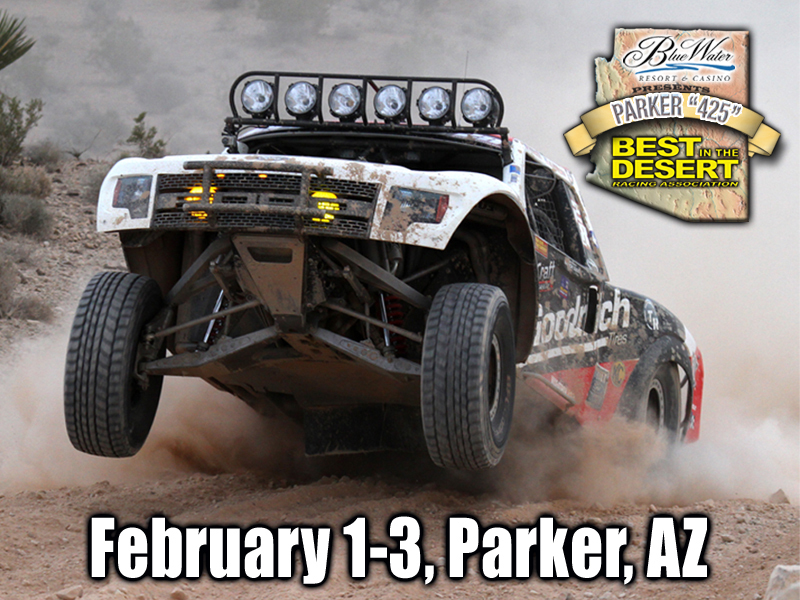 The race weekend continues on Friday, February 1st, as contingency and technical inspection take place in the parking lot of the Blue Water Resort & Casino with the beautiful Colorado River as a backdrop. Race fans will have the chance to get up close to hundreds of race vehicles as they weave their way through contingency row as well as check out the latest off-road and racing accessories from the industry’s top manufacturers. The 2013 edition of the Blue Water Resort & Casino Parker “425” officially gets underway on Saturday, February 2nd, as the green flag drops just past 7:00 AM for the first car or truck on California Ave. in downtown Parker. The huge entry field will be off to challenge the first 425 miles of desert, battling the fierce competition and chasing their dreams of a 2013 class championship. The Parker “425” is also a very spectator friendly race. The famous “Parker Python” infield section adjacent to the main pit area is extremely popular with race fans. Another excellent viewing area is located along Shea Rd., just outside of town. Casey Folks was also excited to announce that the Best in the Desert Trick Truck Challenge has now grown to epic participation – now 23 of the elite Trick Truck teams in the world competing for more than $138,000.This is the third year of the Best In The Desert Trick Truck Challenge where each participating team kicks in a $6,000 fee towards bonus prize money to be paid out to the 1st, 2nd and 3rd place Trick Truck finishers in each of the six Best In The Desert races, plus a year-end bonus. Trick Truck Challenge sponsors include some of the biggest names in off-road racing:, Geiser Brothers, Jimco Racing, MasterCraft, Racer Engineering, Bunderson Racing, KC Hilites, Fox Shox, King Shocks, Kroyer Racing Engines, Patton Racing Engines, Dougans Racing Engines and Rockwell Time! Best In The Desert official sponsors: Ford Motor Company – official truck, General Tire – official tire, Lucas – official oil, VP Racing Fuels – official fuel, KC HiLiTES – official light, John Deere – official UTV, Beta Motorcycles – official motorcycle, Fabtech – official Suspension, Slime, Fall Advertising, Prerunner Maniac, McKenzies, PCI Race Radios, Kartek, Rockwell Time and Sportsman Cycle Sales. Let’s see how many actually start the race! 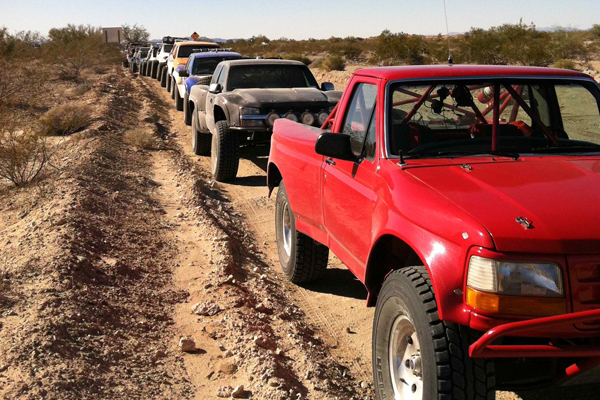 Because the record for REGISTERED Trophy Trucks/Trick Trucks IS NOT 45; about 50 TTs entered the 2007 Baja 500, not counting the three Raid T1 Trucks that entered (2 Race Touareg’s 2 and RG’s H3 Hummer). However, I think only 45 started the race. Could someone please tell me what class (if any) the above trucks represent? Windshiels/side glass still intact?